Safety uniforms are all about visibility. You need to have highly visibility apparel when you are working on the job to protect yourself and others. We can help with all your safety clothing needs. When it comes to printing all these different materials, you must have special ink and if not, the logo will come off after one washing. We have the right inks for the right materials! Our inks are custom, bought for each one of these materials so you can be sure that your safety uniforms will look sharp every time you wear them. 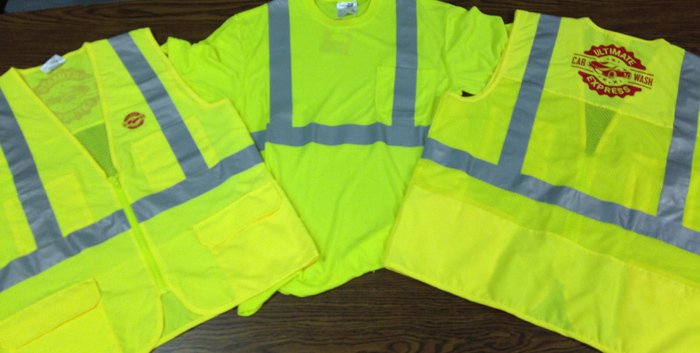 From highly visible apparel to safety vests and safety clothing. We will keep you safe while keeping your logo on it. Give us a call to get your safety uniforms ordered and printed by the professionals.